Bride question of the week: " Has anyone used Groupon for their honeymoon?" Here’s a question that comes up a lot on bridal boards. In your post you have stated that you are nervous about the quality of resort and have had mixed results in the past from Groupon. Your honeymoon is one of the most important and usually the most expensive trip you will take. It will be a memory that can never be redone. 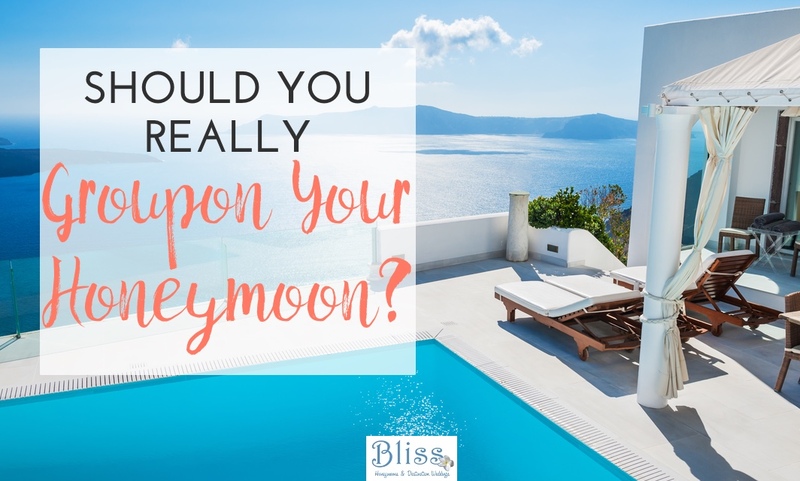 While saving a bunch of money and getting a deal sounds like a great idea it can turn what should have been a dream honeymoon into a nightmare. Travel discount sites will get the rooms that are hard to sell and then they offer them a huge discounts promising travelers a garden view, which in reality looks out over the trash bins and a lonely tree or an ocean view that may require binoculars or an imagination to see. But most importantly, there will be no one to advocate on your behalf if you have issues with your hotel or flights. – What professional certifications do they hold? – Are they able to articulate why they are recommended a certain destination or resort for you? – Are they able to explain all the ins and outs of the trip insurance? – When is the last time they visited the particular resort or destination they are recommending? Lastly go with your gut! You seem to have reservations about booking your honeymoon on a discount site and for good reasons! So many variables are left unanswered by a website. A great travel agent will only be a quick email or phone call away and you don’t have to worry about sacrificing quality for price.